In the blurring worlds of visual arts and crafts, there can be simultaneous explosions of ideas, subject matter, supplies, and inspirations. Those that truly take hold become trends, and a trend run amok sadly becomes that wearying thing you wish would go away. Think owls, deer, mustaches. Fortunately, the things that don’t take hold simply act as threads linking artisans from across the world together. When I began experimenting with a simplistic cloud form in metalsmithing class, the idea bubbled up out of who-knows-where, and seemed to work as a shape that would not require the skills of a master, could absorb mistakes and inconsistencies, and had the potential for variation and expression. So I went with it. You’ve seen the results on the blog here, and above is another of the finished hollow-form brooches, entitled She Wept Crocodile Tears. 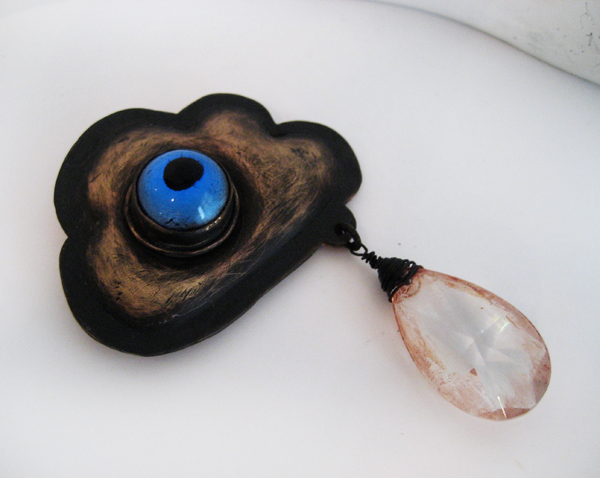 That’s a vintage 1930’s cabochon with a vintage crystal chandelier drop. I hadn’t seen loads of clouds out there in the marketplace, but a recent search pulled up a few… mostly sort of pedestrian, but some that were lovely, cute, scary, weird. This post collects and displays my favorites. 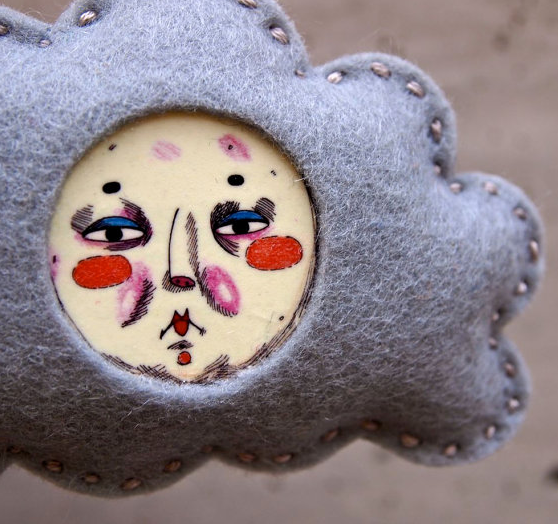 Pictured above, from JessQuinnSmallThings in the UK, the delightful Clarissa Cloud brooch. There is much art to admire and purchase at Jess Quinn’s shop. 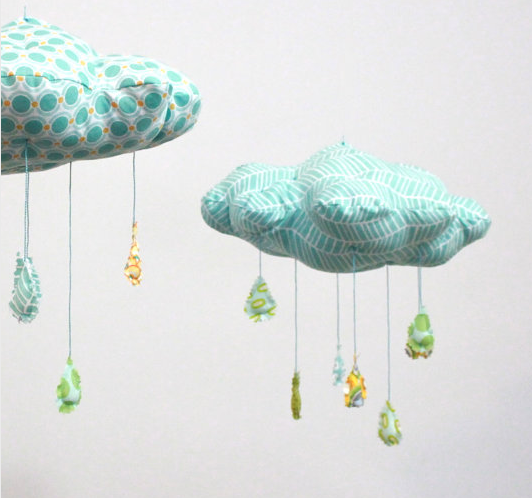 This adorable mobile, Raindrops Keep Falling on My Head, is by BabyJivesCo in Philadelphia, PA, and is one of many tres cute handcrafted baby things available. 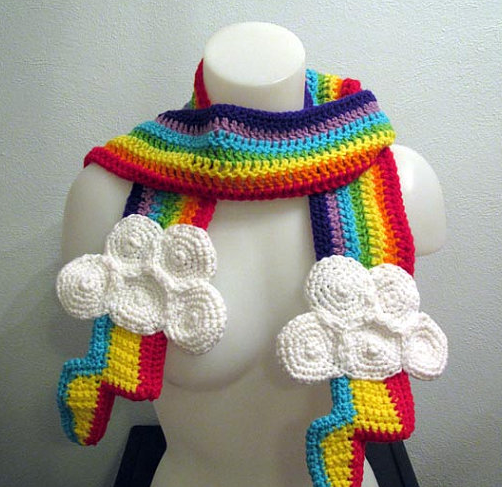 This rockin’ crochet scarf is by Manifested Dreams, from Pittsburgh, PA. Very disco kawaii! 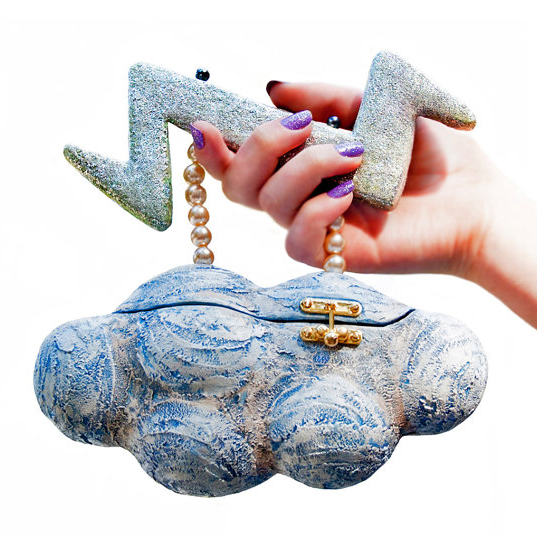 Cloud and Thunder Handbag Minaudiere Purse, from RandomIntent in Atlanta, GA, is very cool. The artist, Debra Gavant’s work, has been written up in major publications (NYT, Art Forum, WWD) and sold at Henri Bendel. 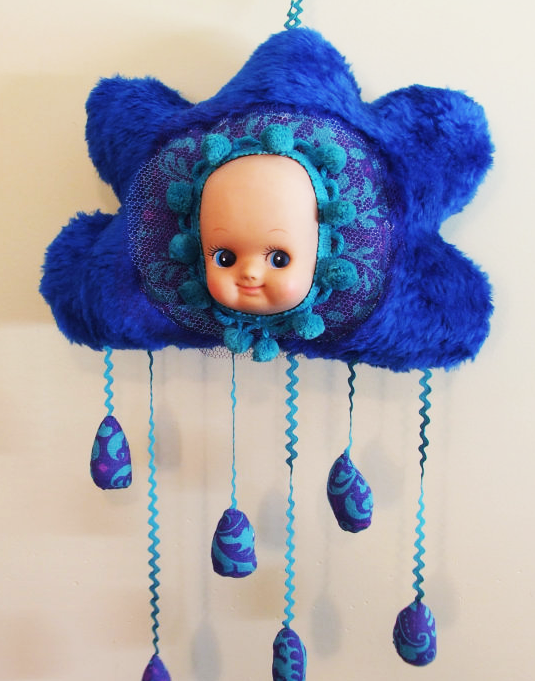 I’ll leave you with the adorably creepy Rain Cloud Dolly, by MungoCrafts of British Columbia. You’ll also find stylin’ handmade hoodies and other fun things at her shop. Great finds Jodi! Love your blog too.